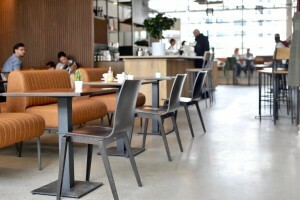 A really chill place to grab a coffee with friends to study or work is DENF Coffee. Located in ‘de witte dame’ in the city centre of Eindhoven this is a go to coffee and lunch hotspot. Jazzy tunes, good coffee and lunch, nice interior and good service. I got to talk to the owner Daan, who always seems to have the time for a chat. He started out roasting coffee in a little shed, and later on upgraded to a location at TAC (Temporary Art Centre). 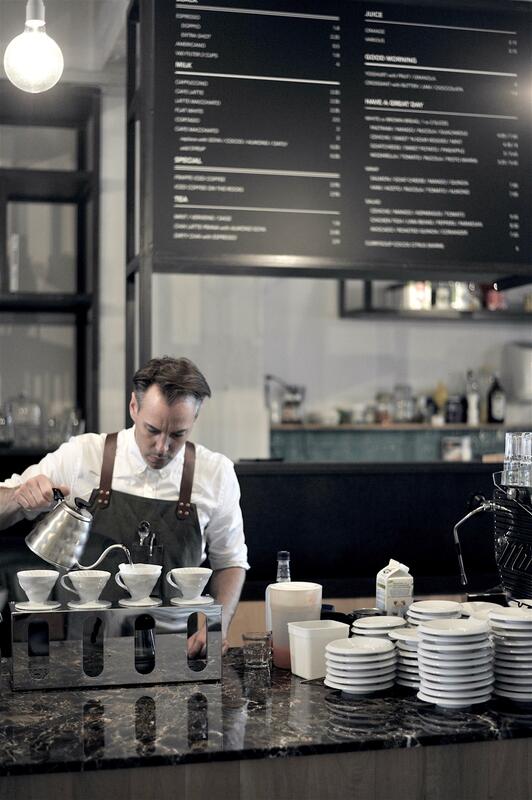 He then added certified barista-trainings to his concept with a partner and moved to the Clausplein under the ‘witte dame’, next to the library and Design Academy where he now runs this really nice coffee hotspot. The barista trainings are sometimes open for the public, and on saturday mornings you can smell the coffee getting roasted live. Daan the owner doing his magic… Photo by Inge van Beekum. The interior of this place is really nice, it has a cosy home feeling and the colors are tranquil and tastefully chosen. The space looks ‘open’ and you can see directly into the roasting area that is behind a glass window, which gives you an insight of how your coffee comes to your table. There’s really good seating, for example on the leather cadillac-seat-sofas that run along the whole side wall, really comfy! There is also a variety of tables, high and low, small or large, where you can work, study have a meeting or business lunch. There is poetry on the wall (by Lars van der Werf from Rotterdam) and there’s a little stage where live music is played every now and then. In front DENF has a terrace (southbound) where you can enjoy your coffee or lunch on a sunny day and look out into the direction of the ‘Bergen’. Check out some of the pictures below (courtesy of Inge van Beekum) to give you an idea of why I like DENF Eindhoven. The music played at DENF is best described easy-listening or jazzy, but it actually depends on the staffs mood. Comfortable Cadillac seats… Photo by Inge van Beekum. 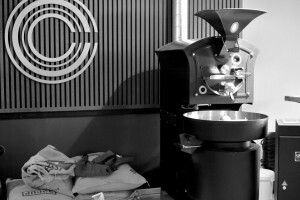 The coffee roasting area…. Can you smell the aromas? Photo by Inge van Beekum. Last time I was here I had a lovely breakfast-plate, which is available all day. It contained a delicious small sandwich (roast beef), yoghurt with granola and fresh fruit, an egg boiled to perfection (7 mins), a fresh juice and a krentenbol with really tasty dairy butter. For the latest menu check out DENF’s website. Besides lunch you can have a variety of coffees here, but also a glass of whine or a beer and lazy afternoon snacks. It’s nice to be able to have a drink when you’re staying a little bit longer than expected. A lot of the visitors of DENF are friends hanging out enjoying coffee and pastry, but also students of the Design Academy love visiting DENF. There’s a mix of opened macbooks (free WIFI of course), meetings, friendly conversation, studying and drawing going on around here. DENF is working together with the Design Academy on an initiative to support a clean-water project in Nicaragua, to sell bottles of water to raise money for this cause. Right now they’re in the idea creation and developing phase, but together they will further develop this project. So you’re probably wondering -as I was since I had been here first- what does DENF mean? The owner gave me a short and mysterious answer. The letters stand for the people who inspire(d) him. Starting with himself (Daan), the E and N are a secret and F is from Frank (the friend who helped him design the logo, for instance). Also the name should be able to use as a verb. Let’s go DENF, let’s go for a DENF, have you had your DENF today? Go on! 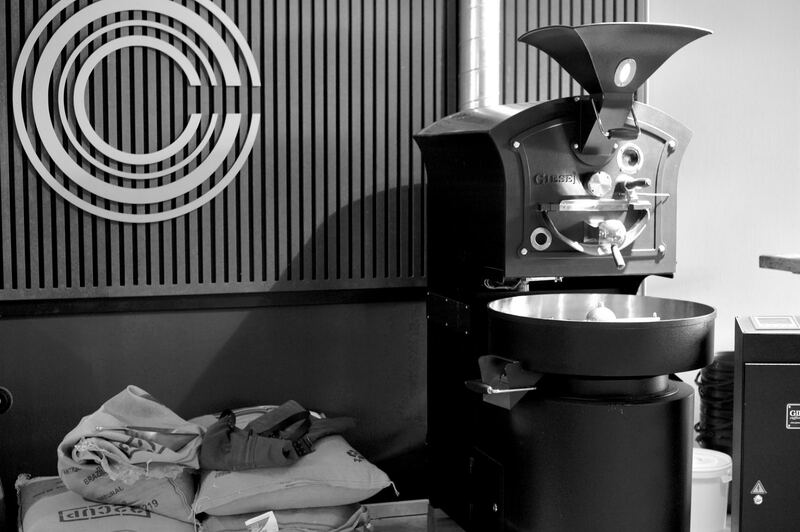 Have your freshly roasted coffee, barista training or lunch at DENF Eindhoven. Other ideas for other lunch hotspots and coffee hotspots can be found here, but only click when you’re curious. ;-). For the latest hotspots or events follow me on Facebook, Twitter or Instagram. 20 december 2016 | Filed under Breakfast spots, Chill Spots, Coffee spots, Lunch spots, Terrace spots.